FUTSAL: Australia's hopes of qualifying for the knockout stages of the Futsal World Cup in Colombia are all but gone after defeat in its final group game to Ukraine. The Futsalroos fought hard but lost 3-1 at the Coliseo Bicentenario in Bucaramanga to finish third after the group matches. The four third-placed sides with the best records will qualify for the last 16 but with final round of games this morning the Aussies look unlikely to qualify. A 11-1 defeat to Brazil followed by this loss gives the Futsalroos a poor goal difference. 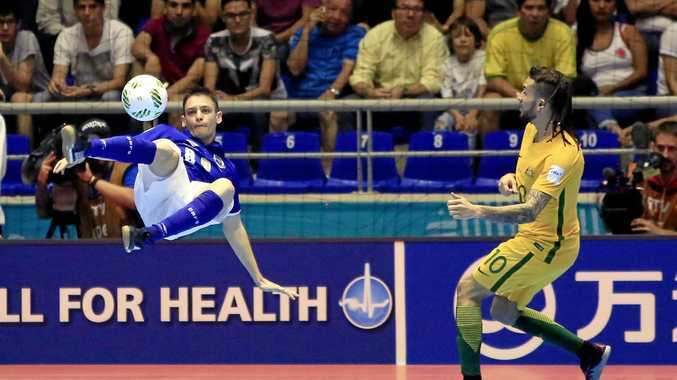 Against the eight-ranked side in the world the Futsalroos gave a good account of themselves. Sergiy Zhurba's shot squeezed under the body of Australian goalkeeper Angelo Konstantinou to give the Ukrainians the lead in the first half. They added to that after the break with a counter-attacking goal from Dmytro Bondar with five minutes remaining. Chris Zeballos gave the Futsalroos some hope with a goal late on and they looked like they were denied a penalty for handball which would have given them the draw they needed to move through to the last 16. Cruelly, though, Ukraine broke again to wrap up the win.